Quaanto | 3 Floyds Brewing Co. 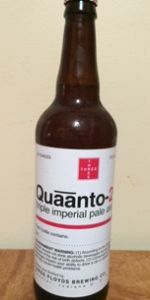 There's nothing like Quaanto... except more Quaanto. A triple IPA. Pours a nice dank copper color. Aroma of apricots. Flavor of.. wham... extreme bitterness that will not subside through the finish. I love FFF high ABV beers and heavy dry-hopping, but this is way too hop-forward for me. Quaanto ain't too shabby looking. It's bright, glowing really, apricot orange that somehow manages to get even brighter where the glass widens... A dusty white, dish soap foam forms on the pour, irregular bubbled and crackling. The head slowly fades to a chunky halo with some whispy islands throughout. It looks ready to get thrown down the hatch. Oh, man. That's a three Floyd's beer. A tremendous mix of tropical fruit and citrus make the hop profile of this beer incredibly complex along the lines of some of their best. A smattering of papaya and spicy guava kick it off but never hold still. Underripe pineapple and gobs of grapefruit in all its forms come next. All these aromas are fluid and ever moving, morphing. There's even an undercurrent of dank forest and old leather. A soft alcoholic note of turpentine actually becomes addictive. That guava grows over time. Mild caramel and biscuit maltiness make for a sturdy base., even some toffee flashes through. The flavor profile of this beer has just about as much depth as the nose but the vibrancy falls a tad short of that high bar. You could take what I mentioned above, about the nose, and place it right here as the descriptor for the flavor. The only difference is that the flavor is coupled with gobs of dried apricots as well which helps make up for that tiny loss of vibrancy in the transition. This is a monster of a beverage but it drinks like slightly less of a monster of a beverage. The body actually weighs in a touch over moderate but there's an active effervescence at work that brings about a good frothiness helping push away any residual sweetness that may have considered sticking around. This beer is brash and bitter and those massive IBUs also help scourge any sugars with bad intentions, as a matter of fact, this beer finishes dry as a bone. Danger, danger. Quaanto is bordering on absurd. By that I mean the unbelievable quality, depth, and cleanliness of a 12.5% triple IPA. This just doesn't happen. It's hugely vibrant, bitter, and dry. It's hugely drinkable, dangerous, and delicious. When this beer is around I will buy it from this point forward. I am not a fan of the Quaanto. It poured a clear copper with white head that did not leave a lace. The scent was nice as most ipas from 3F are. Nice orange peel spice. The taste was most unfortunate....way...way to sweet for me. Did not enjoy. The Mouthfeel was fuller in body with good carbonation. Overall it's worth a try but I did not like it. Quaanto from 3 Floyds Brewing Co.